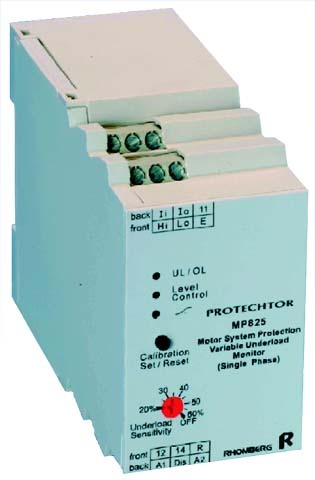 Rhomberg Pump Protection Relays are actually motor protection relays designed for pump applications. Primarily used for submersible (borehole) pump protection, they protect the pump against running dry, jamming of motor, closed valve or no-flow (centrifugal pumps), overcurrent, incorrect phase sequence, phase failure, over and under voltage. They are microprocessor based and are calibrated at the push of a button. (Available in DIN rail format only). Unit automatically calibrates for underload and overload detection at the push of a button. Calibration reset for easy setting up of motor changeover. Direct in-line current sensing for motors up to 1.1kW. Direct interface with conventional current transformer for motors>1.1kW. Adjustable restart timer on underload (ie running dry). Fixed start-up delay (3 seconds standard). Unit latches in de-energised state on overload fault only. 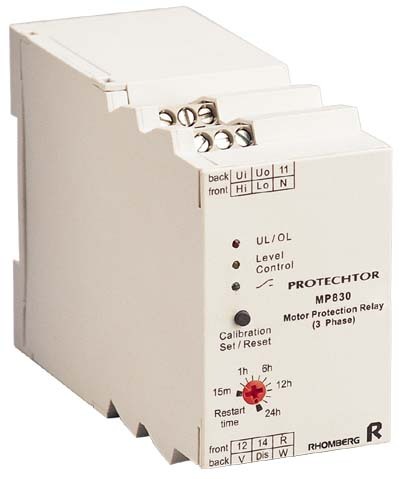 LED indication of all fault conditions and all modes of operation. Direct in-line current sensing for motors up to 3.75kW. 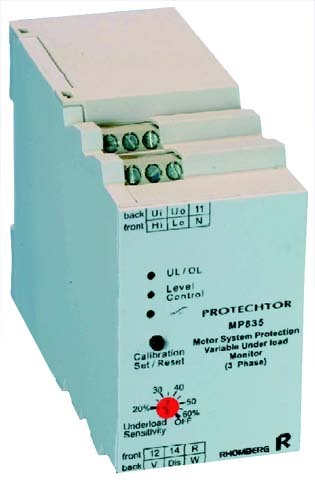 Direct interface with conventional current transformer for motors>3.7kW. Phase Sequence and phase failure detection.